With man-made or natural disasters occurring unexpectedly in all corners of earth, rescue efforts would be a lot easier and more successful if portable energy sources such as solar power or wind power would become more readily available. PowerMod is one solution that makes solar power more accessible. 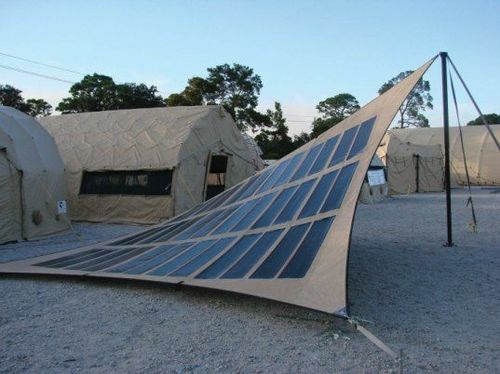 PowerMod is a portable solar tent that is ready to help in relief work serving victims of disaster. PowerMod is the simplest kind of shelter – a 20×20 ft. roof of flexible panel. The panel is made by integrating FTL Solar lightweight fabric and Ascent Solar’s thin-film solar cells. It is supported in the center by a pole. It gives a power output of 4.5 kilowatt hours/day. It weighs approximately 165 pounds. It can be assembled in 15 minutes and does not require more than 2 people for assembly. Solar power is not a fire hazard and has no poisonous fumes or other hazardous elements. Nor is there any need for huge containers to ferry the material to the disaster site, at a huge cost to the relief-rescue expenditure. PowerMod works on clean, emission-less energy, at low cost. It provides enough power to run essentials such as lights, fans, laptops, refrigerators, AC equipment and to power batteries, charge cell phones, etc. It is portable, light-weight, needs just 2 people and 15 minutes to be assembled and it looks neat and uncluttered.